Headed down to Hediard on a rainy day to take advantage of an offer we claimed on fb. The offer got extended by the way, so you can still claim it on their fb page. 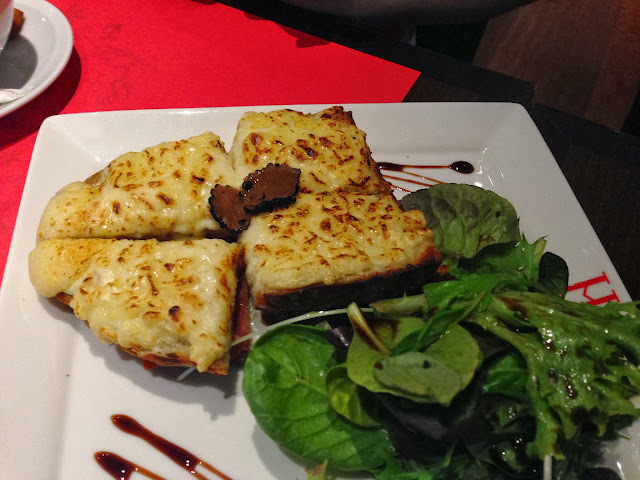 $10 off for one of their main items – croque ferdinand etc. Their refillable pots of tea come with a fruit jelly and a madeline. Both were outstanding. The madeline was not fresh but I liked the distinct browned butter fragrance. The blackcurrant fruit jelly that I got was bursting with flavour. 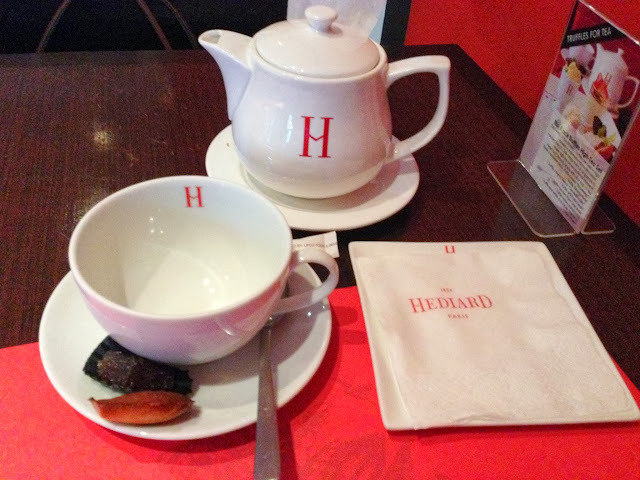 We ordered the Special Hédiard which included their famous Croq’ Ferdinand, a duck foie gras served like a terrine, fig jam, and smoked salmon. I loved the sticky sweet fig jam which helped to cut through the saltiness of all the cheese. 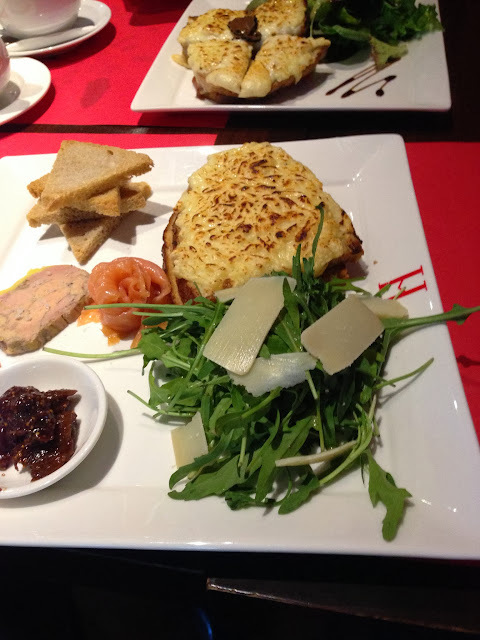 While I don’t think Hediard has much of a kitchen (since most of the things in their menu are derived from products already packaged and made in Paris), they toasted the croque ferdinand well. The more luxurious version of the Croq’ Ferdinand is the Croq’ Ferdinand with Black Truffles. They were pretty generous with the truffle oil- it smelt amazing when it arrived! I enjoyed this much more than the original, and I guess that is reflected in its higher price. 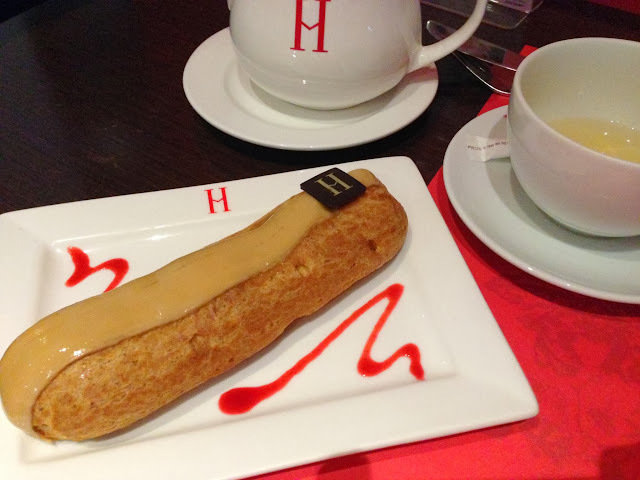 The coffee eclair with cardamom-coffee cream was huge. Unfortunately the choux was dry (short of being stale thankfully) but the cream was pretty interesting and delicious. The cardamom was so strong that we couldn’t taste the coffee! Stay away from this if you hate that particular spice.